The Mormon Tabernacle Choir and the West Point Band joined musical forces to thrill an audience of more than 10, 000 spectators at the 2015 Fourth of July concert, “Music Under the Stars.” Four thousand cadets, including the new freshman class at West Point, arrived in military formation for the Independence Day gala on Trophy Point overlooking the Hudson River. The legend of the West Point Band, also known as the Hellcats, began early in the American Revolution, when units of George Washington’s Continental Army, including fifers and drummers, established the garrison of West Point in January of 1778. The concert is being produced as a half-hour radio and TV special for next year. 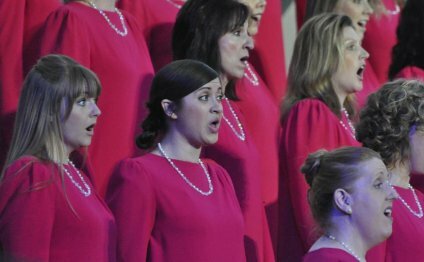 Ed Payne, the executive producer of the Mormon Tabernacle Choir’s weekly broadcast of “Music and the Spoken Word, ” is heading up the recording project. He was inspired by a similar special the choir recorded with legendary news anchor Tom Brokaw to celebrate the 10th anniversary of September 11. While on tour on the Eastern seaboard, the choir and orchestra also performed in Bethesda, Maryland, and in upstate New York at Bethel Woods, the home of Woodstock, at the Saratoga Performing Arts Center and in two concerts at the famed Carnegie Hall in New York City. The tour will conclude in Boston, Massachusetts, on July 6 with a concert at the Citi Performing Arts Center Wang Theatre.